The ranking looked at crime, insurance rates for women, the wage gap and the cost of a one-bedroom apartment, among other things. New Jersey is one of the 13 worst states in the country to be a woman, according to a new ranking that looks at the wage gap, access to birth control, insurance, housing and violent crime. 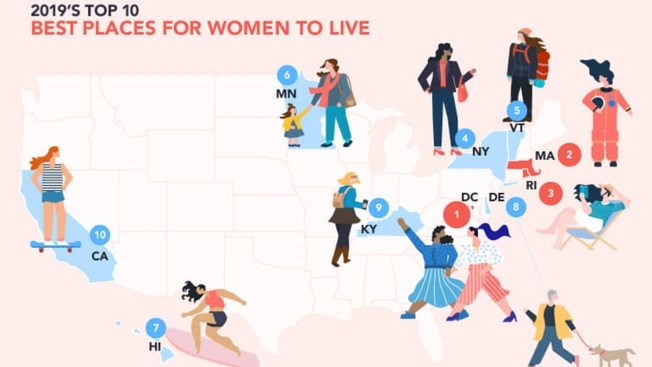 Move.org ranked each of the states in the country plus Washington, D.C., using a range of data sets to find which states are most "conducive to women's success, safety and happiness." It found that the 10 worst states for women to live were Alabama, Idaho, Mississippi, Wyoming, South Carolina, Louisiana, Utah, Oklahoma, South Dakota and Kansas. In Louisiana, women only make $0.69 on every dollar a man makes, the study found. New Jersey was the 13th worst state to be a woman, in part because of its lack of policies for women on accessibility to birth control coverage without a co-pay or deductible, Move.org told NBC 4. In the Garden State, women make $0.80 to every dollar a man makes. New York ranked as the 4th best state to be a woman. In the Big Apple, women make $0.88 to every dollar a man makes and birth control coverage is available without a co-pay or deductible. Meanwhile Connecticut ranked as the 12th best spot to live as a woman, where only six percent of women who live there are uninsured, compared to New Jersey where 9.6 percent are uninsured. "One of the great things about the state of Connecticut is that you can get birth control coverage without co-pay or deductible," the study's authors told NBC 4. Washington, D.C., Massachusetts and Rhode Island took the top three spots. "The District of Columbia isn’t just home to our nation’s capital — it’s also home to the best place for women to live in the US! Women in Washington, DC, make $0.89 for every dollar a man makes," Move.org said. To determine its ranking, Move.org assessed data on the population of major cities, the average rent of a one-bedroom apartment in city centers, the total number of post-secondary schools in major cities, violent crimes in major cities, birth control coverage without a copay or deductible, the percentage of uninsured women ages 18–64 and the gender wage gap.